Get ready for music from your Game of Thrones Music Box. 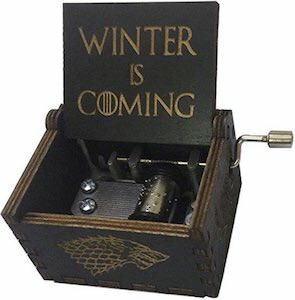 This music box will play the Game of Thrones theme song when you wind the lever and that is just fun for young and old no matter if they even like Game of Thrones. The box is made from wood and comes in a whole range of colors that you can all see by clicking the picture and on the box it says “Winter is Coming” and it shows the Direwolf logo from house Stark. A real Game of Thrones fan that like unique things should definitely check out his fun music box as it is something different and fun.